“Holy Baptism is the basis of the whole Christian life, the gateway to life in the Spirit . . ., and the door which gives access to the other sacraments. 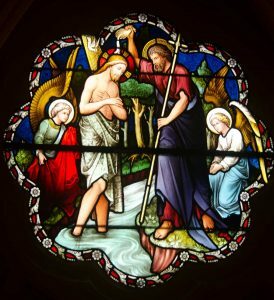 Through Baptism we are freed from sin and reborn as [children] of God; we become members of Christ, are incorporated into the Church and made sharers in her mission.” Catechism of the Catholic Church, #1213. Infants and young children: Following the ancient tradition of the Church, most Catholics are baptized as infants or young children. In this case, the Church accepts the faith and testimony of the parents and godparents that the child will be raised in the practice of the Catholic faith. Generally, at least one parent and one godparent must be Catholic for a child to baptized in the Catholic Church. Parents are expected to meet with a member of our staff in preparation for the sacrament. For more information, please contact Father Marty Demek, (410) 523-4161. School-aged children and youth: The process by which a school-aged child or youth is prepared for the sacrament of baptism will depend upon the age of the child, his or her level of understanding of faith, and the religious education the child has received. Because each child must be evaluated on an individual basis, please contact the Coordinator of Faith Formation, (410) 523-4161, to discuss the baptism of a child or youth in this situation. Adults: Adults are baptized through the Rite of Christian Initiation of Adults (RCIA). For more information on the RCIA, please click here. 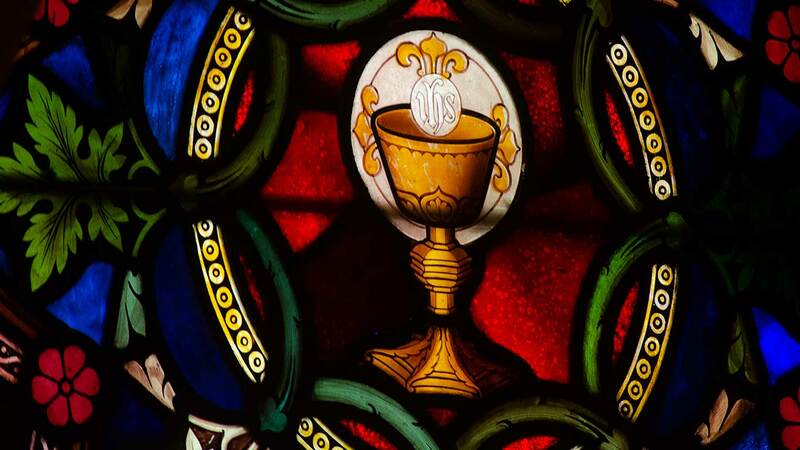 “[T]he Eucharist is the sum and summary of our faith: ‘Our way of thinking is attuned to the Eucharist, and the Eucharist in turn confirms our way of thinking.’” Catechism of the Catholic Church, #1327. Children and youth: Children typically receive their First Holy Communion in the second grade, although they may receive the sacrament at a later time. The Archdiocese of Baltimore requires all children to have received at least a full year of formal religious education before the year in which they intend to receive the sacrament. For more information about our religious education program for children, please click here. You may also contact the Coordinator of Faith Formation, (410) 523-4161, with any questions you may have about preparing a child for First Holy Communion. Adults: Adults are typically prepared to receive Holy Communion for the first time through the Rite of Christian Initiation of Adults (RCIA). For more information on the RCIA, please click here. “[B]y the sacrament of Confirmation, [the baptized] are more perfectly bound to the Church and are enriched with a special strength of the Holy Spirit.” Catechism of the Catholic Church, #1285. Youth: At Corpus Christi, young people begin preparations to receive the sacrament of confirmation in the Fall of their ninth-grade year. The Archdiocese of Baltimore requires them to have attended a full year of formal religious education in the year before they receive the sacrament. For more information on this program, please contact the Coordinator of Faith Formation, (410) 523-4161. Adults: Adults are typically prepared to receive the sacrament of confirmation through the Rite of Christian Initiation of Adults (RCIA). For more information on the RCIA, please click here. “Those who approach the sacrament of Penance obtain pardon from God’s mercy for the offense committed against [God], and are, at the same time, reconciled with the Church . . . .” Catechism of the Catholic Church, #1422. The Sacrament of Reconciliation offers the opportunity to experience God’s forgiveness, as well as to be empowered by God’s grace. There are a number of ways to receive the sacrament at Corpus Christi. Confessions may be heard every Saturday afternoon at 3:30 p.m. in the church. Confessions may be heard by making an appointment with the pastor. Confessions may be heard during our Advent and Lenten Penance Services, usually celebrated with the parishes of St. Ignatius and St. Vincent de Paul. Times, dates, and locations are announced in the bulletin. Children are prepared to receive the Sacrament of Reconciliation through our religious education program. Please contact the Coordinator of Religious Education, (410) 523-4161, for more information. Adults are typically prepared to receive the sacrament through the Rite of Christian Initiation of Adults (RCIA). For more information on the RCIA, please click here. “By the sacred anointing of the sick and the prayer of the priests the whole Church commends those who are ill to the suffering and glorified Lord, that he may raise them up and save them.” Catechism of the Catholic Church, #1499. The Sacrament of the Sick promises the faithful presence of God and the healing power of the Spirit to those who are sick. Contrary to popular thought, the sacrament is not the “last rites,” and it is not reserved for those who are dying (although it is perfectly appropriate for them). The sacrament is for anyone who is struggling with a serious illness or who is of advanced years and wishes to be embraced by the grace of God. An illness can include anything physical, mental, emotional, or spiritual and is considered serious if it moves beyond the everyday ailments we all encounter – the common cold, a bruised knee, a bad day. As a general rule, if your illness requires hospitalization or a skilled procedure, you are eligible for the Sacrament of the Sick. The Sacrament of the Sick is best celebrated in a deliberate, calm manner – especially when family and friends can join in its celebration. Its reception in an emergency should be the exception, not the rule. Please do not wait for your illness to reach a crisis level before requesting the sacrament. The sacrament can be received at home, at church (perhaps, after mass), in the hospital, or any other appropriate location. Contacting the priest ahead of time will facilitate its careful and deliberate celebration. If you are hospitalized at any time, be sure to inform the hospital that you are Catholic and the parish that you attend. Tighter restrictions on the dissemination of patient information precludes hospitals from notifying a patient’s parish themselves, so please call (or have a family member call) the parish so that arrangements can be made for someone to visit. We also invite those who wish to be on our parish prayer list to notify us so that we may join in prayer with and for you. If you would like to make a prayer request, please click here. “The covenant between . . . spouses is integrated into God’s covenant with [humans]: ‘Authentic married love is caught up into divine love.’” Catechism of the Catholic Church, #1639. “Holy Orders is the sacrament through which the mission entrusted by Christ to his apostles continues to be exercised in the Church until the end of time: thus it is the sacrament of apostolic ministry. It includes three degrees: episcopate [bishop], presbyterate [priest], and diaconate [deacon].” Catechism of the Catholic Church, #1536. The Archdiocese of Baltimore provides information about receiving the sacrament of Holy Orders. For information about ordination to the priesthood, please click here. For information about ordination to the diaconate, please click here.